Dead Again is a fun, weird romp through reincarnation, melodrama, and Kenneth Branagh-Emma Thompson's Greatest Hits. A fluffy murder mystery dressed up in classical Hitchcock-style aesthetics with a dash of Branagh-style theatricality, it is whimsical and not too gory and very silly. Expect much intentional and unintentional humor. One day, detective Mike Church (Kenneth Branagh, in an American accent) agrees to help his old orphanage out with a bag lady problem they're having: a mysterious mute woman (Emma Thompson), suffering from amnesia, has wandered onto the grounds and keeps having screaming nightmares. Mike takes the lady in and tries to find out where her memory went; his friends, Pete (Wayne Knight (!)) the forensics guy and Dr. Carlisle (Robin Williams, in a very good beefed-up cameo) the former psychiatrist quack, try to help. But the biggest help comes when the dapper, take-charge hypnotist Frank (Derek Jacobi) enters the scene. After just a few sessions with Frank, the woman - now called Grace - has regained the ability to speak and is busy reliving her past life as Margaret Strauss (Emma Thompson, again), eminent pianist and wife to the dashing European composer, Roman Strauss (Kenneth Branagh, in a (sexier) German accent this time), way back in post-war LA. The same Strausses who ended up all over the 1940s newspapers after Roman was convicted of murdering Margaret with a pair of scissors. What does it all mean?! Will Mike and Grace fall in love as per their predetermination? Or will karma catch up with them, as Dr. Carlisle insists it will, and they'll just murder each other all over again?! And what is Grace's real name anyway!?!?! It all comes together in a delightful, unexpected conclusion that we'll not spoil here. But suffice to say it includes jarring cross cuts (our favorite filmy thing ever! ), blood-pumping choral music (our favorite Kenneth Branaghy thing ever!) and lots of gasps and close-ups and unexpected laughter (from us, that is). 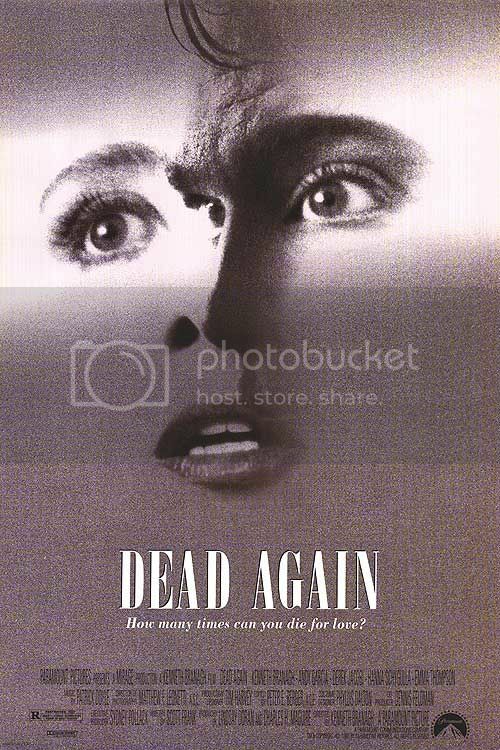 The charm of Dead Again is that it doesn't take itself too seriously, even though everything is played straight. Everyone looks like they're having a rollicking good time swaning around the 1940s black-and-white scenes (all white tie events, mind you) or engaging in some earnest, cringe-worthy 1980s rom-com-style flirting ("I can read tea bags, you know?" Mike schmoozes; OH GOD). Robin Williams' glorified cameo is a great performance filled with hilariously vulgar dialogue; it's worth it just to see him in this cross between The Fisher King and Good Will Hunting. Kenneth Branagh and Emma Thompson are at their charmingest peak (this was their period, after all! ), and the whole film is like a tribute fest to their past and future work: the masked ball which we'll see again in Much Ado About Nothing, the domestic horrors reminiscent of Look Back in Anger and Patrick Doyle's rousing, bombastic score straight out of the goosebump-inducing St. Crispin's Day speech from Henry V. Andy Garcia has a nice role as the tobacco-addicted journalist, while Campbell Scott's cameo made us laugh and laugh and laugh. Our conclusion? Definitely see it. And then write Kenneth Branagh and tell him he is and always will be King Arthur. Definitely agree. And also I didn't see the twist coming. "Campbell Scott's cameo made us laugh and laugh and laugh."